"Before last year I hadn’t read any Frances Hardinge and now I can’t believe how much I had been missing out! Twilight Robbery came out in paperback early in 2012 and I picked it up thinking it looked interesting, not realising that it was a sequel . . . luckily this didn’t really matter and I was very quickly hooked, so much so that several books later I’m now eagerly awaiting the next Hardinge book. 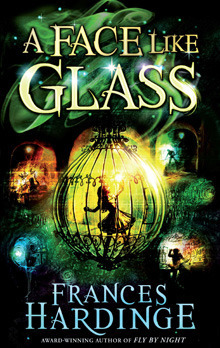 A Face Like Glass is a typical Frances Hardinge book and has everything I would expect from her previous books: a gripping narrative, great characters and fantastic writing – in fact her writing style is something that I love the most and I think makes her stand out from the rest of children’s fiction – it’s tight, imaginative prose with a good amount of humour coming through. She doesn't write down to her audience and her books are perfect for the more advanced 9+ reader and suitable for up to 12+. When 5-year-old Neverfell turns up in Grandible’s cheese tunnels he's surprised that someone has been able to evade the very extensive defences that he’s been working on for years - and even more shocked by her face. But he takes her under his wing and starts teaching her his skills and protects her from the world outside his tunnels. For seven years Neverfell lives with Grandible, working on his cheeses and wearing a mask whenever she answers the front door or gives the cheeses to the delivery boys, convinced that her face is so horrible no-one will be able to stand to look at it. Then one day she suddenly finds herself in the 'outside' world of Caverna - a mass of tunnels extending up, down, and back on itself, where plots and assassinations are part of everyday life. Here she finds that her face is more dangerous than she could have imagined. For, in this world, everyone must learn their expressions; happy, sad, angry . . . they must all be taught by the Facesmiths. But Neverfell’s face is like nothing in Caverna – it’s a face like glass that needs no taught expression for it shows her thoughts and emotions clearly for everyone to read. It is more dangerous than she could possibly realise and, in a world where people covet the best and latest in fashions, Neverfell becomes the next desirable commodity to acquire . . .
A Face Like Glass is a riveting read and Frances Hardinge creates a truly imaginative, exciting and quirky world. 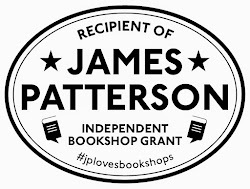 Whilst her books are fantasy books, I think they would appeal to a much wider audience – anyone who’s read Kate O’Hearn, Philip Reeve, Maile Meloy’s The Apothecary or other adventure stories would be sure to enjoy these. I wouldn’t compare them to these books, but I think anyone who likes exciting adventures will get a lot out of Frances Hardinge.! "I’m a big fan of Michelle Paver – years ago my younger sister really got into the Chronicles of Darkness Trilogy and I was one of the last in my family to borrow the books and be completely captivated by her stories. 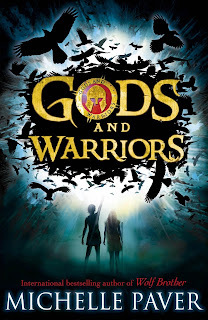 I was quite excited that she had started a new series and eager to find out if it was as good as the tales of Renn, Torak and his pack-brother Wolf. I am pleased to say it lived up to everything I had hoped. Set in the Mycenean Bronze Age, the story takes place a few thousand years later than Wolf Brother. As with Wolf Brother, there is a little bit of magic involved in the book, but it is a magic evoked from the old ways and is in keeping with the prehistoric and superstitious nature of the society – a society that is still close to nature and believes in gods who control different aspects of life and the elements. The magic in it doesn’t get in the way of the story and certainly doesn’t make it overly a fantasy novel, but gives it an otherworldly quality of ancient worlds. The story is based around three children – Hylas, an Outsider and poor goatherd, his friend, Telamon, a wealthy chieftain’s son and Pirra, the daughter of a high priestess destined for an arranged marriage but longing for the freedom she thought was promised to her when she reached the age of 12. 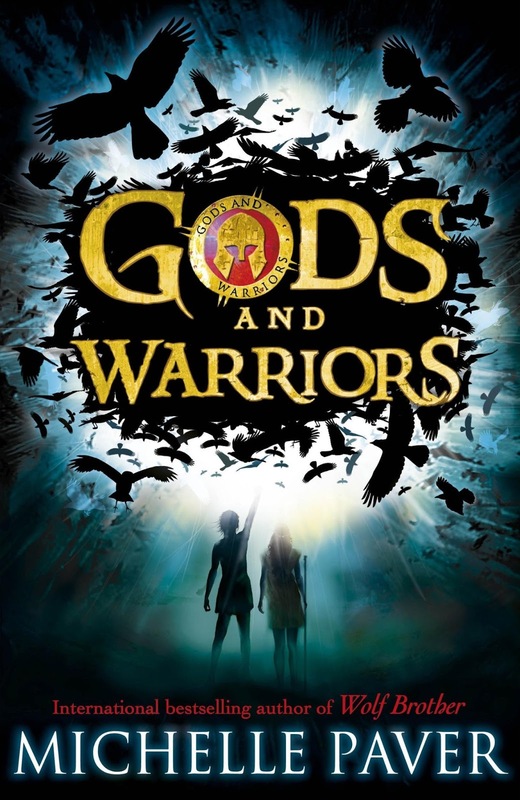 This first book centres around Hylas who is caught up in the chase to recover a sacred dagger that The Crows – so named because of their dark skin and armour - believe make them invincible. Believing an outsider to have stolen it, they are hunting them all down and in the ensuing chaos Hylas and his little sister are separated. Concerned that she will never survive on her own, Hylas sets out to find her but must also protect himself as the Crows continue to search for him and the dagger. These three characters are all quite different and the conflicts that inevitably arise add to the believability and reality of the story. Hylas is tough and self-reliant because as an orphan looking after his younger sister he’s always had to be. He knows little of the world beyond the mountains in which he tends the locals’ goats except what he’s heard from stories. Telamon, an unlikely friend, is the complete opposite and is caught between loyalties – to Hylas, to his father and to his clan and honour. Then there is Pirra, a girl who is used to a world of luxury but would prefer her own freedom to all the trinkets in the world, and she will do anything to get it. Their different characters means there is often conflict between them and Hylas and Pirra especially must learn to trust one another if they are to escape. Finally, there is Spirit – a dolphin that rescues and befriends Hylas and whose voice really adds to the story. Paver’s books are brilliant for children 9+, with fantastic writing and her amazing research shows through, adding seamlessly to the story without being forced or unnecessarily included. What is especially nice is that Paver writes a book unequivocally for and about children and whilst parts of the story are told from the point of view of animals, it’s never cheesy or out of place and works really well. All her characters are wonderful and vibrant, showing their courage and strength in different ways. I would strongly recommend reading any of her books." "Up for the Costa this year, it definitely deserved some recognition. 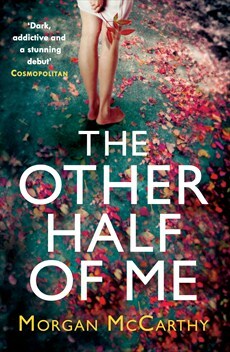 I read this at the beginning of last year when it came out in hardback and absolutely loved it. 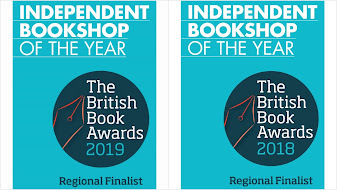 When I had to think of my top books from last year, I really struggled, as is inevitable when you read a lot, it can be difficult to remember everything and pick out the especially good ones from all the generally enjoyable ones! This book really did linger with me afterwards and was one I repeatedly recommended to friends and family so qualifies perfectly for my favourite books of the year. It had the feel of some of the old classics, Evelyn Waugh’s Brideshead or Fitzgerald, the doomed upper class family etc, exploring some interesting themes including education and class, sanity and madness and science and faith. It is a powerful read that explores the vulnerabilities of genius and the naivity of young, bright minds and centres around the Bellwether family and Oscar Lowe. Oscar, a bookish young care assistant, is on his way home one day when he is drawn into a church by the music drifting out of its doors. In this way he happens to meet the beautiful Iris Bellwether, a medical student, and her idiosyncratic brother, Eden, an organist whose music it was that so attracted Oscar that fateful night. Falling in love with Iris he is drawn into her privileged and educated world amid the Cambridge colleges and finds himself caught up in the strange machinations of the brilliant but troubled Eden. A music prodigy, he believes in the healing power of music and the theories of a forgotten Baroque composer, Johann Mattheson. He’s so adamant in these theories that he undertakes a series of disturbing experiments with his friends to prove himself right – sometimes without their consent. Iris is concerned that her brother might suffer from delusions of grandeur and asks Oscar to help her find proof of Eden’s illness so she can get him psychiatric help. So enters Herbert Crest, an elderly psychologist who is researching alternative medicine and the healing power of faith. The question of Eden’s sanity soon becomes obvious as things begin spiraling out of control, with conflicts rising to the surface and only Oscar seems to recognise the danger. It is with a wonderful languid pace and compelling opening scene that Wood grips you immediately, increasing to an intense climax but all written with a beautifully deft and light touch. This is a gripping and skillful debut novel with richly drawn character and I look forward to more from Benjamin Wood." "I only discovered Ann Cleeves earlier last year when we did an event with her. Her Shetland series has now become one of my favourite crime literature books. Set in the Shetland Isles, they have a wonderful atmosphere to them and I really love the characters, particularly the laid back Inspector Jimmy Perez. This book won the Crime Writers’ Association Duncan Lawrie Dagger for 2006, and definitely deserved to. 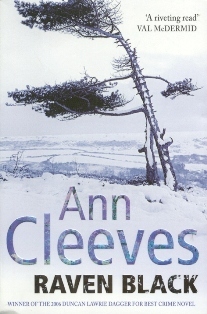 What I particularly love about Ann Cleeves’ books are the sense of place she creates – the cold and the isolation of these islands is almost tangible, along with the dominant, clawing tight knit community where nothing is able to be kept secret for long and where all appear united but tensions lie just below the surface. There is a slight Nordic quality to the place (but not to the plot line!). I really like Ann Cleaves’ writing which is light crime and, I feel, more like crime literature than crime thrillers or dramas as they are very much about solving the crime and the mystery rather than being overly dramatic. After dropping her daughter off at school one morning, shortly after New Year, Fran Hunter finds her eye drawn to a violent slash of red across the snow. As a painter, she draws closer thinking solely of the colours and composition, only to discover the body of her teenage neighbour Catherine Ross. The locals soon focus their attention on one man – a loner and simpleton who has once before been accused of the abduction and murder of a young girl eight years previously, Magnus Tate. The community is soon consumed by an atmosphere of suspicion and fear as outside officers are called in to help and Inspector Jimmy Perez must try to stop the investigation becoming too narrow. Slowly but surely, using his own methods which rely more on talking and observing, he uncovers the hidden secrets and relationships under pressure that lead him to the killer. It is a neatly plotted book with a good pace and is beautifully written, combining perfectly the old-fashioned mystery whodunnit with the psychological crime. All the characters have their own voice and are depicted really well, and there are enough of them for there to be plenty of suspects, clues and red-herrings to keep you guessing. It builds to a great climax and conclusion and after reading this I have now read the following two in the series and see them as a real treat to read. If you’re not so much of a crime thriller reader, but enjoy the odd mystery then you might like this too." "The Other Half of Me is a darkly gothic and memorable debut about two siblings growing up in a rather grand but neglected Welsh manor house. Whilst not a fast-paced book, I found it thoroughly enjoyable and what I particularly found gripping was the dark undertone conveyed through the undercurrent of conflict within the family and put under further strain by their deeply buried secrets. McCarthy has a beautiful writing style with elegant and evocative descriptive prose. The book predominantly focuses on the lives of Jonathan and his little sister Theo as they grow up in the large house and wild gardens of their ancestral home, Evendon, in Wales. They run wild most of the time, living a free and languid life filled with Theo’s extravagant fantasies and games exploring the mysteries and hidden parts of the garden. With few friends at school the two are understandably very close, an inevitable result of their mother’s neglect and are only partially governed by the cook, cleaner and nanny, and presided over by the dominating portrait in the dining room of their grandmother Eve. After their mother, Alicia, attempts suicide and is sent away for help, the mysterious and grand Eve comes home to look after them. Whilst Jonathan comes to idolize Eve, Theo’s odd-behaviour becomes more apparent in contrast to Eve’s cultured and dominant matriarchal character. Theo continues to grow more ethereal and vacant, living in her own world and on the occasions that she seems more lucid and tangible she is disturbed by odd ideas and whisperings of the family’s dark secrets behind closed doors. In contrast, Jonathan is ambitious and works hard to impress Eve and emulate her business success as he trains to become an architect. Whilst he moves on and leaves Evendon, he becomes more distant with Theo and misunderstands her own-preoccupations and behaviour as a result of drug use. The growing gap between Jonathon and Theo is echoed with his relationship with his childhood friend and neighbour, Maria, a girl he is in love with but who finds his ambition is making him increasingly callous and cold. Whilst Jonathan thrives in his new environment, encouraged by Eve and his own success, Theo does not, constantly dropping out of college courses and Eve-arranged jobs. Unreliable and flaky, her behaviour irritates Eve beyond endurance as she becomes increasingly obsessed with their long-lost father and is convinced that all the stories they have been told about his disappearance are lies. Soon the mysteries of Evendon and the fates of all the people surrounding Eve bring tragedy to this haunted family. This was a beautiful but brooding story of these two children and the sad glamour in which they are constantly surrounded. It was the kind of book that grips you without overly relying on drama and focused more on the psychological effects brought about by family secrets. 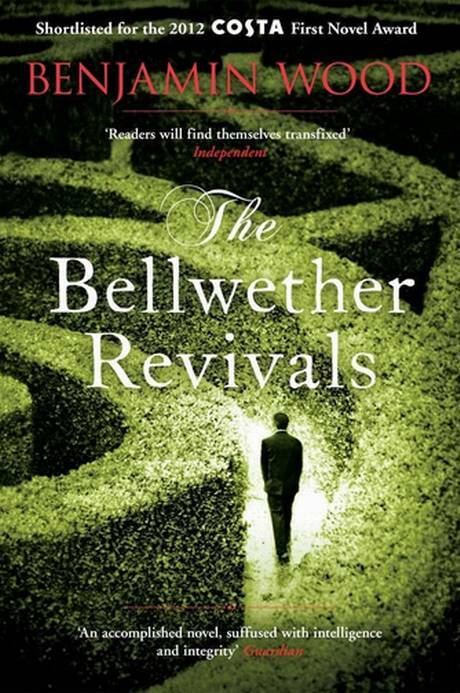 McCarthy is a master at crafting this tragic tale of damaged souls in a way that enthralls the reader. Certainly it is a story of lies and sadness, mystery and loneliness but it is also one of love."